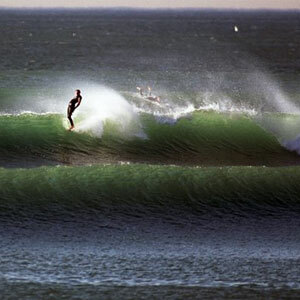 A little over 25 years ago three people in Malibu, California found out that their favorite wave was about to be destroyed. Think about that for a second. Think about something you love…something that gives you enjoyment. Taken away. First Point, pictured to the right, the quintessential perfect California wave was about to be destroyed. Those three people organized and worked with the local municipalities until they were satisfied that their efforts to preserve that iconic wave would be successful. This was the genesis of Surfrider Foundation. Today, we are doing this same thing in about 18 countries around the world. Our mi ssion is the protection and enjoyment of oceans, waves and beaches through a powerful activist network. You can think about that as three concepts. “Protection and enjoyment”, we don’t want to put a velvet rope around a beach and tell people to keep off. We’re surfers, we’re beach goers, we’re watermen… we enjoy the coasts. We’re a user group. Next up is “oceans, waves and beaches.” Think coastlines, we’re engaged with environmental issues that affect our coastlines. “Powerful activist network” speaks to how we go about this mission. We are a grassroots organization. We’re local in many coastal regions. We’re moms, we’re surfers, we’re kids and teens…we’re you. We’re engaged to protect what we love: oceans, waves and beaches. We would love to have you join us, you can join Surfrider here.